Salesforce Architect by day, Trailblazer by night, Susannah Kate St-Germain is a 9x certified technology nerd. Susannah started her career as an accidental admin….she actually went to college (and graduate school) for music! 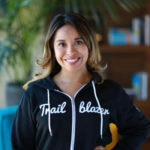 After dabbling with Salesforce administration for years at multiple nonprofits, she took the plunge and pursued a full-time career in tech after getting inspired at her local Women in Tech user group. Susannah was one of the first graduates of the RAD Women Code program, and since then, her career has skyrocketed. First as a Salesforce Developer and recently as a Salesforce Architect at Fortune 500 company. In her spare time, Susannah spends time with her dog Parker, rewatches episodes of Buffy the Vampire Slayer and Veronica Mars, and learns new coding languages. Susannah’s favorite part of being a Salesforce architect and developer is that she learns something new everyday. Ladies, you CAN Be Architects!